Adoption of autotransfusion devices is influenced with largely with increasing occurrences of heart disorders and cardiac surgeries. In addition, autotransfusion devices are used in surgeries related to hemorrhage, orthopedics, neurology as well as gynecology. Advanced medical equipment technologies have gained high preference in medical science due to higher success rate and patient outcomes. Such is the case with autotransfusion devices that are witnessing growing acceptance across the globe with a higher number of hospitals and other healthcare facilities opting for these devices to increase their patient outcome. Global autotransfusion devices market is expected to grow at a high pace in the years to follow. With higher prevalence of cardiac surgeries, the use of continuous blood flow systems has become imperative, pushing the end users to use autotransfusion devices. Moreover, this system has reduced or zero chance of blood infections, less chance of isosensitization, enhanced oxygen transfer, increased action of coagulation factors and recued consumption of homologous blood. In addition, with these devices, postponing of operations owing to blood shortage is eliminated. This has fuelled the demand and use of autotransfusion devices across regions. As per analysis of Transparency Market Research, global market for autotransfusion devices is estimated to reach a value of over US$ 2 Bn by the end of the year of assessment (2026). Companies involved in autotransfusion device manufacturing have invested in research and development to enhance their current offerings and introduce advanced systems to increase success rate and patient survival. Manufacturers involved in development of autotransfusion devices include Advancis Surgical, Atrium Medical, Stryker, Terumo Corporation, Medtronic, LivaNova, Haemonetics and Fresenius Kabi. North America is expected to showcase high market attractiveness with respect to use of autotransfusion devices. Sale of these devices has been rising over past few years in North America due to increasing cardiac surgeries. Moreover, higher prevalence of heart disorders, cardiovascular surgeries, reconstructive surgeries and vascular grafting has been witnessed in North America, which has fuelled the demand for autotransfusion devices in the region. According to analysis done in the report, the sale of autotransfusion devices in this region is expected to touch US$ 890 Mn by end of 2026. 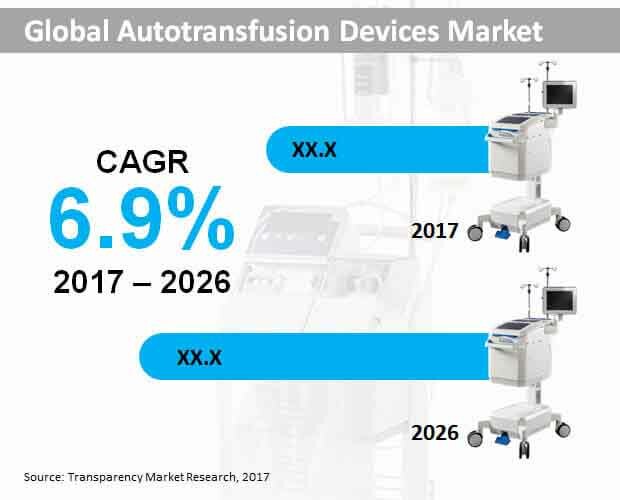 With higher percentage of population suffering from heart diseases in United States, use of autotransfusion devices in the country has increased, thus making US a major contributor to the growth of the autotransfusion devices market in the North America. In this region, the use of off pump transfusion devices is higher owing to higher blood transfer efficiency and increased oxygen transfer.